I have performed in a variety of styles and settings over the last 22 years. My musical projects have ranged from hard rock to jam bands, funk, jazz, a trio that performed completely improvised music, solo classical performances and various duo configurations. While attending Appalachian State University in Boone, NC, I performed extensively on the local music scene in a handful of bands. I also performed in the Appalachian State University Guitar Ensemble at this time, under the direction of Dr. Douglas James. While studying guitar performance with Mark Mazzatenta at the University of North Carolina at Greensboro, I received instruction in both jazz and classical guitar. 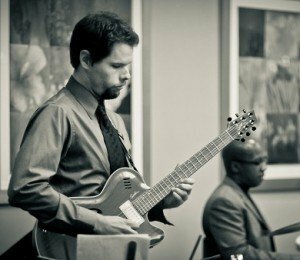 I performed in the UNCG Jazz band and attended clinics with notable jazz musicians such as Reuben Rogers, Wessel Anderson, Ralph Bowen, and Joey Calderazzo. 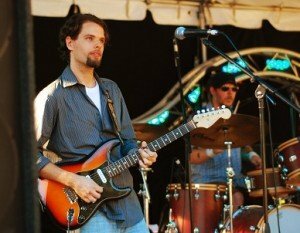 Since then, I’ve stayed busy writing and recording my own music, playing occasional jazz gigs, and playing with an assortment of bands in Greensboro: Bitterroot (instrumental prog rock), Hot Politics (funk), The Heavytones (blues/funk/rock), The Storytellers (smooth jazz), and Just3 (jazz/fusion). I’ve written a collection of original fingerstyle guitar pieces, and I play solo classical guitar at weddings and private events. Along the way, I’ve performed at many of the local music venues around the triad as well as across North Carolina. You can hear some selections of past projects of mine on the recordings page of my website. My teaching journey began after finishing college when I took a job teaching English in China. For three semesters, I taught English classes at a university in the city of Guangzhou to college freshmen. This was when I discovered how much I enjoy teaching, and started thinking about other things I could do that involved it. Upon returning to the United States, I decided to continue to pursue teaching along with my other great passion: music. I enrolled at the University of North Carolina at Greensboro School of Music and studied for a year in their Miles Davis Jazz Studies program. Around this time, I started taking on my first private guitar students. I also began teaching guitar lessons and small classes at Erwin Montessori Elementary School, where I was a guitar tutor for two school years. After UNCG, I went full time with teaching private lessons and started to build a teaching practice. I have now been teaching guitar lessons for 11 years, and have helped hundreds of students learn to play or improve their guitar skills. I currently teach full time out of my home studio, where I see around 50 students per week.